Originally appeared in the Spring 1998 edition of The Quarterly, published by the San Francisco Urban Institute at San Francisco State University. Da Mayor never knew what hit him. Not known as one to understate anything, San Francisco Mayor Willie L. Brown, Jr., surely did so at his press availability on July 15, 1997. "Critical Mass has reached critical mass," declared the Mayor, who had earlier in the month promised to impose law and order on the monthly bicycle happening, likening its participants to a group of lawless Hell's Angels. Following this initial tirade from Mayor Brown, the local media played up the impending confrontation, filling the airwaves and newstands with speculation about the "crackdown." All the town was abuzz about da Mayor versus da bikers. However, it soon became apparent that the Mayor, generally viewed as an unflappable master deal-making politician, was on the verge of coming unhinged. Had Brown perhaps underestimated his opponent? What the Mayor didn't know then, but surely knows now, was this: In going up against Critical Mass, Mayor Brown was confronting the leading edge of a growing global movement intent on dramatically changing the urban environment. Call it the "Sustainable Cities" or "Alternative Transportation" movement. Many debate whether Critical Mass, with its prominent slogan "One Less Car", is a cause, a result or merely a highly visible element of this movement. In any event, it is one prominent manifestation of the increasing resistance to the disruption and damage created by auto-dependency. 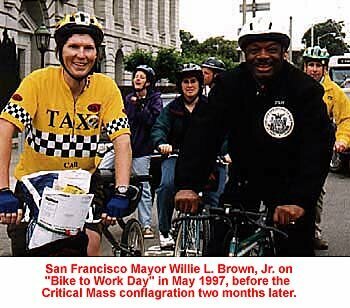 Critical Mass began in San Francisco in 1992, a fusion of the city's radical political tradition with the sizable community of cycling enthusiasts made possible by a favorable climate. Outdoor recreation meets mass action. Like many things that start in California, Critical Mass quickly spread. There have been nascent Critical Mass events in hundreds of cities around the world, from Sydney and Melbourne, to London and Bristol, to Toronto, Chicago, Boston, Richmond, Austin, and even Walnut Creek. As Critical Mass has proliferated, other protest actions have also developed against the destructive presence of automobiles in cities. Reclaim the Streets events, large "spontaneous" street parties that often attract thousands of participants, have occurred in London, Berlin, Sydney, Edinburgh, Amsterdam and other cities. After creating an "obstruction," such as a fake car crash, participants quickly flood the targeted street with banners, musicians, stilt walkers, fire breathers and PA systems. Participants often dig up the street and plant trees, or create children's play areas complete with wheelbarrow loads of sand. "It's not so much of a 'pedestrian thing'," explains Randy Ghent of the Lyon-based Collectif pour des Rues Libérées. "It's more of a movement to reclaim urban space from the clutches of the automobile." Together with protest events like Critical Mass and Reclaim the Streets, there has been a significant growth of publications, web sites, conferences and organizations devoted to reducing auto-dependency. In October 1997 a week-long conference in Lyon, France, "Toward Car-Free Cities," attracted 65 activists representing 50 organizations from 21 countries. The Car Free Cities Network was launched with 37 founding organizations in 1994 at a conference in Amsterdam. With more than 60 European cities participating today, the network points to Venice as evidence that car-free cities can function well while enjoying a high quality of life. Locally, the San Francisco Bicycle Coalition (SFBC) has grown to more than 1,700 dues-paying members. With a decentralized organizational structure that depends heavily on member initiative, the SFBC has promoted numerous projects around the city that encourage bicycle use. Among the many examples of the coalition's work is Tiffany Street in the Mission District. Once used by 6,000 cars a day as a shortcut to Interstate 280, Tiffany was made a dead end street after SFBC members helped organize neighborhood residents to demand traffic calming. The coalition was also instrumental in forming the Transit First Market Street Alliance, a consortium of transit, community and environmental groups currently working to prohibit private cars from Market Street. The question posed by this growing international movement is: What are streets for? Are streets places where kids play ball, where young adults play pickup soccer, where parents teach their children to ride bikes, where neighbors meet and talk? Are streets places where lovers stroll, shoppers browse, spontaneous human theatre and people watching flourishes? Are streets places for festivals, fairs, parades and block parties? Are streets places for rallies, marches, demonstrations? In short, are streets "public spaces" that nurture community? Or are they simply utilitarian corridors for automobile traffic? Pushed by the political clout of automobile manufacturers, petroleum companies and others in the highway lobby, US politicians have turned public roadways over to car traffic, especially in the years following World War II. In the process they gutted mass transit, encouraged suburban sprawl, paved over extensive farmland and open space, and destroyed inner-city communities. All to create an automobile-dominated transportation system that works increasingly poorly. Caltrans estimates that Bay Area commuters wasted 90,000 hours every day stuck in traffic in 1996, a 31-percent increase over 1995, costing the regional economy more than $210 million a year. As traffic congestion worsens, the usual knee-jerk response - build more roads - is prohibitively difficult. The cost, both financial and political, of road building has become exorbitant. The recently rebuilt Cypress Freeway in Oakland, which collapsed in the 1989 Loma Prieta earthquake, has a price tag exceeding $1.25 billion. At roughly $4,000 per inch, the five-mile Cypress is the most expensive freeway in history, more than five times the cost of NASA's mission to Mars. As the negative impact of freeways on the safety, health, economic vitality and property values of city neighborhoods has become better known, urban residents are showing greater resistance to new elevated highway projects, as was evident in the recent Central Freeway fight in San Francisco. The auxiliary costs of our automobile-dominated transportation system are also becoming more apparent. Each year traffic accidents kill 42,000 people and hospitalize another million, straining emergency rooms and rehabilitation facilities, driving up the cost of healthcare. Cases of asthma and other respiratory ailments are increasing as air quality deteriorates. While most people understand that there is no such thing as a free lunch, they want to believe in free parking. Yet the reality is that the cost of creating and maintaining parking spaces is paid out of shoppers' wallets. The cost of housing is driven up by the need to create shelter for motor vehicles and the considerable space devoted to roads and parking. More than 40 percent of the typical US city's land area is paved over to accommodate cars. The notorious phenomenon of road rage is only one example of the increased stress and societal breakdown caused by our auto-dependency. While the automobile has an undeniable role in the US transportation system, its use for everyday urban commuting is becoming an exercise in futility. Getting people out of their cars requires the development of attractive alternatives, such as bicycling, walking and especially better mass transit. The majority of all trips taken in the US are under three miles, a distance easily traveled by bike. More city residents are discovering that the bicycle is often a faster, healthier and less stressful method of getting around town. Among other things, public policy planners could encourage more people to use bicycles by making streets safer (i.e. by slowing down traffic), developing safe bicycle parking and creating better intermodal access for bicycles on mass transit systems. "People who drive death machines are not monsters. They have all been pedestrians, most have ridden bikes. Our tactics must show that the device and not the driver is opposed. They believe that automobiles are essential, but we represent life without them. Our refusal to remain unnoticed may cause them to examine their choice, and our example will give them an alternative." More than 5,000 cyclists arrived at Justin Hermann Plaza to participate in the July 1997 Critical Mass event in San Francisco. Some were first-time participants attracted by the publicity following the Mayor's remarks. Others were infrequent "massers" galvanized by the controversy. As the ride began, it was clear that the flimsy "deal" negotiated by City Hall would fall through. The police restored order as they often do in such situations: through excessive force. More than 100 people were arrested, including several pedestrian bystanders. July's Critical Mass made national headlines, including Time, the cover of USA Today and PBS's "The Lehrer Newshour". Writing "pity the political movement that doesn't make enemies," the San Francisco Bay Guardian selected Critical Mass as a "Local Hero" in its annual "Best of the Bay" edition. San Francisco Chronicle writer Glen Martin called bicycle advocacy "the hottest political movement in the country today." Many have described the July 25 event as the Stonewall of the anti-car movement. It couldn't have arrived at a better time. Around the world more people still travel by bicycle than by car. However, many newly industrializing countries are "modernizing" by following the car-dependent example of the US. From Beijing to Manila to New Delhi and elsewhere, the result has been growing traffic congestion among the other myriad problems associated with the automobile. Declaring "We're Not Blocking Traffic, We Are Traffic," Critical Mass participants are sending a message from the heart of the internal combustion beast to the developing world: Don't make our mistake and let the automobile destroy your communities. In doing so, bicyclists are building on the legacy of the original freeway fighters of San Francisco, who made the city the first in the US to turn back the tide of elevated roadways in the 1960s. Mayor Brown was right. As far as the movement for more livable cities is concerned, critical mass has been achieved. 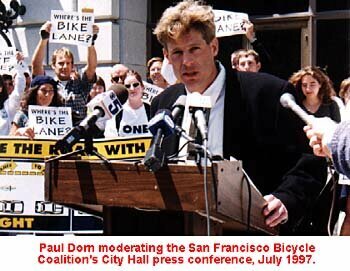 Paul Dorn served on the board of directors of the San Francisco Bicycle Coalition and is a former editor of the coalition's newsletter, the tubular times.